The Minister for Defence said we must accept we are putting troops in harm’s way when we deploy them to these types of operations. 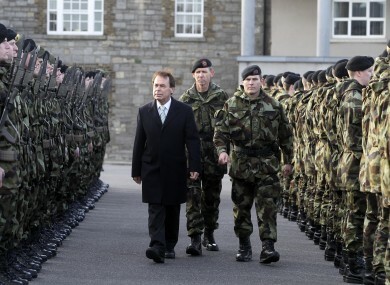 MINISTER FOR DEFENCE Alan Shatter has said there are no indications that anti-government elements in Syria see Irish troops based there as a target. Last month, troops stationed in the Golan Heights region, as part of a UN peacekeeping mission, were caught in the crossfire of a gun battle between warring pro and anti-government factions. More recently, a convoy was fired upon and a vehicle in which Irish troops were travelling struck a landmine, though no one was seriously injured. In response to parliamentary questions from a number of TDs about troops being targeted, Shatter said there are “no indications at this time to suggest that the anti-government armed elements see Irish troops as a target”. Shatter told TDs that “it was never the case that deployment was going to be easy” and that it was known at the time the Dáil considered sending troops that the region was unstable. Both the political and the security situation in the region is volatile; that is why we are there. Clearly, when we deploy troops to these types of operations, we must also understand and accept that we are putting them in harm’s way and that situations, such as the recent attack, can and will happen. He said personnel of the Irish Defence Forces are fully trained and equipped with appropriate force protection assets to undertake their duties. “The performance of the equipment and personnel in this most recent incident is testament to the standard and quality of the equipment which the Defence Forces have at their disposal and of the commitment and professionalism of our personnel,” Shatter commented. In a recent visit to the Middle East, the minister said troops in Syria, who are there to assist in operations in the ‘Area of Responsibility’ between Syria and Israel, are “fully committed to their task”. Email “Shatter: No indications Irish troops in Syria are a target”. Feedback on “Shatter: No indications Irish troops in Syria are a target”.